Sixty-nine of these locomotives were built by the Birmingham Railway Carriage & Wagon Company (BRCW) from July 1961 and October 1962. BRCW also built the similar Class 26 and Class 33 locomotives. The class 27s had 1250hp 6LDA28B Sulzer engines and GEC electrical equipment and had maximum speed of 90mph. The locos also differed from the class 26s by having a headcode box above the cab windows. The first 23 locos, D5347-D5369 locos delivered to the Scottish region based at Eastfield (although D5347/48 spent their first month at Thornton Junction). As built these locos featured T-shaped recesses on the drivers' cabsides for token-catchers (however these were never fitted). The next nine, D5370-D5378, were built without train heating boilers, and were delivered to the North Eastern Region based at Thornaby. 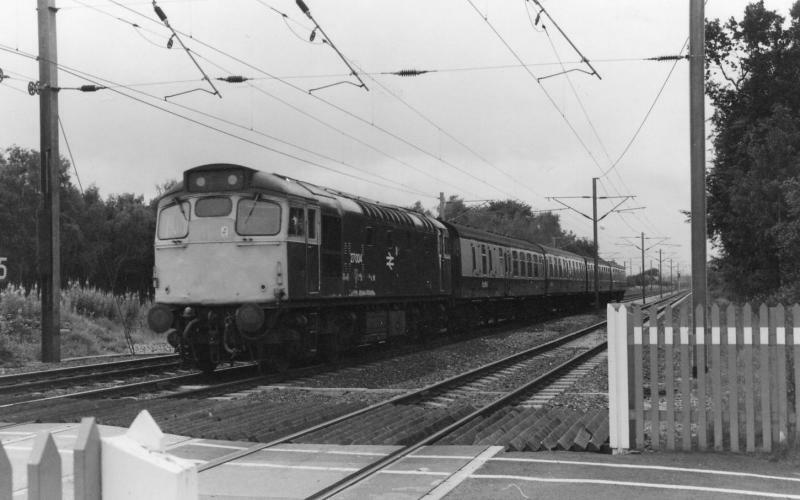 The final thirty-seven locos, D5379-5415, were delivered to the Midland lines, based at Cricklewood. Between 1968 and 1970 the whole class had moved up to Scotland, with the exception of withdrawn D5383. At this time Haymarket Depot gained an allocation. A new push-pull service between Edinburgh Waverley and Glasgow Queen Street was introduced in May 1971, replacing class 126 DMUs. This used dedicated 6-coach rakes of Mk2 stock fitted with air operated disk-brakes, multi-core jumper cables and air-pipes to enable locomotives coupled at each end to work in multiple. At first only 14 dual braked class 27s were provided, and class 25 and class 37 locos were frequently used as stand-ins. Over the next 2 years Glasgow Works equiped 10 more class 27s with the necessary air brakes. The push-pull 27s also featured automatic fire detection allowing the loco at the rear to run un-manned. Renumbering of the class in 1973 saw the push-pull loco's numbered 27101-124, with the remainder becoming 27001-44. Electric Train Heating was fitted to 12 of the push-pull locos in the mid 70s, using an alternator driven by an auxiliary 172hp Deutz diesel engine located in the former boiler compartment. 27119-124 were converted first, followed by 27113-117,103. These locos were soon renumbered into the 27201-212 series. At this time 27118 became the second 27103. The push-pull workings came to an end in 1980, having been replaced by Class 47s and Driving trailers. The class 27s had been staple motive power on the West Highland lines for 20 years, but were replaced by class 37s from 1981. However the class did gain some new duties replacing DMUs on the Edinburgh - Dundee, Glasgow - Stranraer and Inverness - Aberdeen routes. Another renumbering scheme took place from 1983, with the remaining former push-pull locos given numbers in the 27045-066 series, although 27206, 27207 & 27208 retained their identities until the end. During the 1980s the class was gradually replaced by the more powerful class 37 and class 47 locomotives. Passenger duties ended in 1986 and the final vacuum brake only locos were withdrawn. In September 1986 21 locos remained, all allocated to Eastfield depot. A mass withdrawal in July 1987 left 27008 as the last in service - final working on 13th August and officially withdrawn on 19 August 1987. Many of the class were cut up by Vic Berry of Leicester (see group messages). Created by Dysgraphyk and last modified by Brechinbranch at 18:38, 29 of November 2016.